Colonel Ellsworth’s portrait via the National Portrait Gallery. His close association with Lincoln and the Union cause, as well as the manner of his death, made him an early martyr for the Union cause. Today’s article was originally published in our sister blog about unexplained phenomena of the South, Dixie Spirits, itself based on my book by the same name. In that tome we investigated the Custis-Lee Mansion, also known as Arlington House, which still stands near Alexandria, Virginia, but we did not explore the many other Civil War related ghosts and haunts of Alexandria proper. Today let’s take a quick look at one well known Civil War haunted down in the city proper. They say the first casualty of war is the truth. That may well be true, but in the early days of the war, neither side was much concerned with truth, but more with justifying their own actions, as well as portraying the opposite side as the aggressor. Regardless, by the time that Lincoln was inaugurated, the time for rational discussion was already over and the Secessionists moved quickly to surround Washington, DC in the weeks following his installation as President. Lincoln could call for 75,000 troops—but actually organizing, equipping and fielding them to defend the capitol was quite another thing. The original zouaves were Algerians, recruited by the French to serve in their army. Their elan in battle became legendary and many “zouave” regiments were formed during the Civil War in emulation of them. Before the war, volunteer militia units were quite the rage in the US. In the antebellum era it was fun to be a soldier and many volunteer groups donned colorful costumes, learned to drill like real soldiers and above all, attract the ladies with their displays of martial virtue. 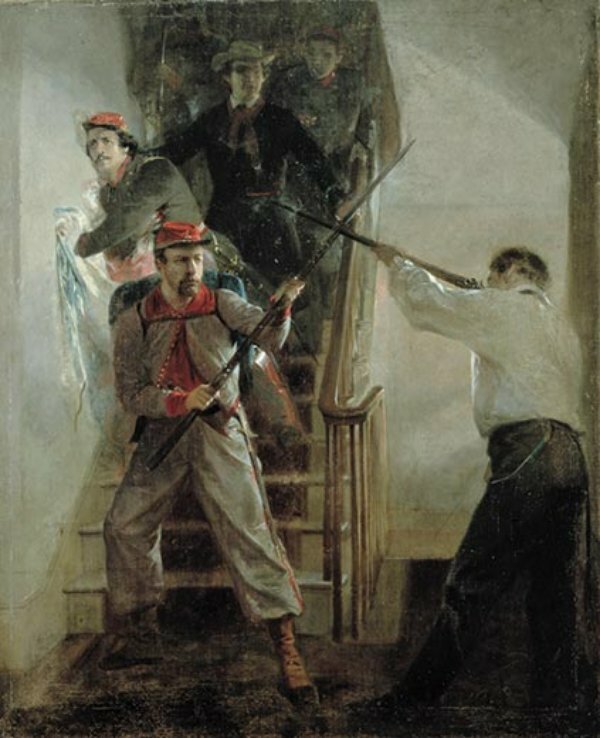 Some militia groups developed a reputation for their skill at close order drill and toured the country performing for the public, especially those units who fashioned themselves as zouaves. 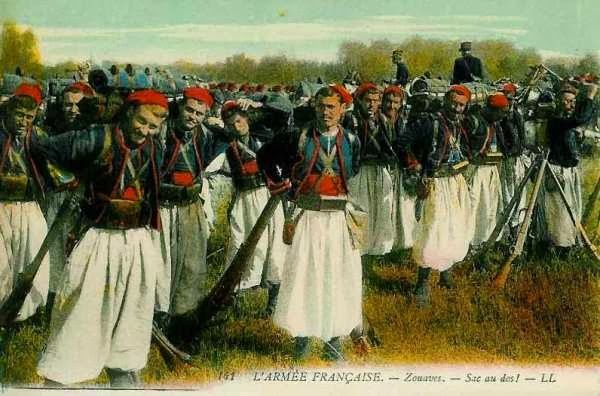 The original zouaves had been recruited by the French in Algeria and wore colorful oriental style uniforms, but over the years their ethnic makeup was of less importance than their reputation for élan and aggressiveness. Recruiting for a Zouave regiment, NYC in 1861. While considered elite units, zouaves could also be quite rowdy when not in combat. One of the more famous such show units was Colonel Elmer E. Ellsworth’s Cadet Zouaves, originally based out of Chicago. Although he was never able to get into West Point, Ellsworth had studied military tactics with a passion and his fencing instructor in Chicago had been an actual French zouave. Ellsworth was a close personal friend of Lincoln’s and when the call went out for volunteers to suppress the rebellion, Ellsworth wasted no time forming a regiment. Ellsworth went to New York City, where he sent out a call for the bravest and the boldest, seeking out firemen in particular. Within an amazingly brief time received more than double the number of volunteers than he needed. Although rough around the edges and short on discipline, the 11th NY “Fire” Zouaves were shipped south in short order. The Marshall House as it looked early in the War. Note the tall flagpole on the roof of the building. Its owner was a brutal slave owner and fire-breathing Secessionist. When, on May 23, Virginia officially seceded from the Union, Ellsworth’s regiment was ordered across the Potomac to secure Alexandria and Arlington Heights on the Virginia side of the river. While securing the city, Ellsworth noticed that a Rebel flag was still flying over the Marshall House, a local inn. The flag had been something of a sore point for weeks, being visible from across the river and symbol of Lincoln’s inability to preserve the Union even within the shadow of the capital. Not willing to allow this act of defiance to go unanswered, Ellsworth personally climbed up to the top of the Marshall House and tore down the offending flag from the large flagpole on the roof. As he was descending the stairs, however, the hotel owner, one James Jackson, suddenly appeared without warning and shot and killed Ellsworth with a shotgun at close quarters, for which action he was immediately rewarded with his own death at the hands of Ellsworth’s men. It was still early in the war and the death of a single officer, such as Ellsworth, was still notable news in the North. Ellsworth being a close associate of Lincoln amplified the importance of his death. Soon Ellsworth was hailed as a martyr—the first of many—to the cause of preserving the Union. “The murder of Colonel Ellsworth.” His ghost was sighted in the Marshall House on repeated occasions over the years. In the ensuing months and years following his death, rumors began to circulate that, although dead, Colonel Ellsworth was not really gone from the Marshall House. Some claimed to see him removing the Rebel flag from the rooftop of the hotel, others swore they saw his shade on its stairs, where he was murdered. It was also said that the ghost of the fire-breathing Secesh James Jackson also haunted the same stairwell in the old inn. The Marshall House and its ghosts stood on the same spot until the 1950’s, when it was torn down as part of a modernization trend in the city. Normally, that would be the end of the story, but apparently it is not. 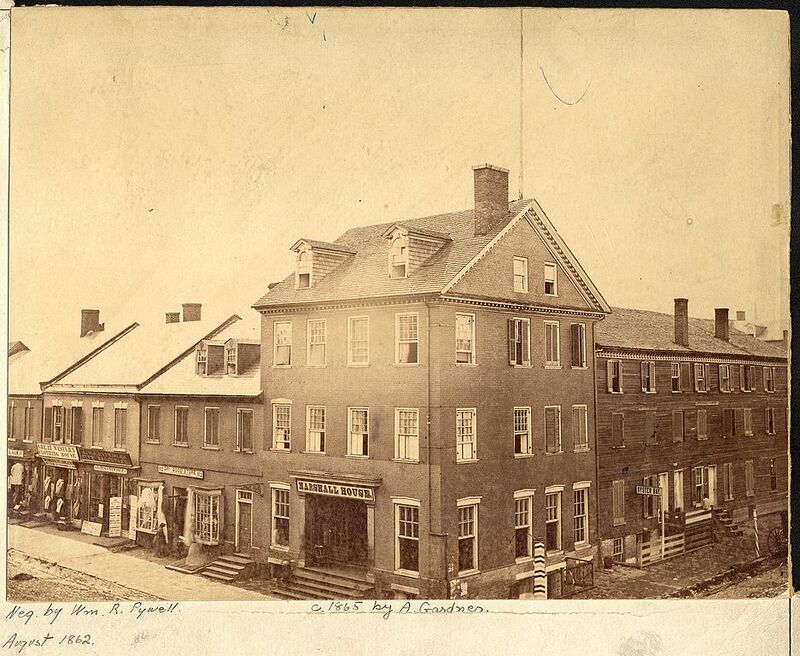 Today the Monaco Hotel, a “boutique hotel,” occupies the same space where the old inn stood. It has all the amenities one expects in a modern hotel, plus one more: it is haunted. There are those who claim that it is the restless shades of the Civil War who still roam the new hotel. Sometimes nothing is actually seen, but people claim to hear the sound of gunshots out in the hallways, as if the Rebel hotel owner and the zouaves who killed him are still having it out in the new building. On one occasion recently, a couple was riding the elevator when it unexpectedly opened at the fourth floor; no guests were there but they saw a glowing light appear on the wall opposite, then disappear. Later, the visitors found they were not alone in having uncanny experiences there. 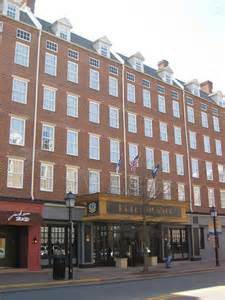 Some visitors allege the modern hotel on the site of the old Marshall still holds the ghost of Ellsworth and perhaps of his murderer. According to some, it is the Monaco’s sixth floor that is most haunted, which could be a reflection of Ellsworth’s flag taking venture, although the reports are vague on that score. Regardless, the hotel embraces the site’s haunted heritage and in the Fall offers a “Ghosts of Alexandria Family Package” which includes discounted room rate, a stay on the “haunted sixth” plus tickets for the local ghost tour of the town. Not a bad deal and maybe Colonel Ellsworth will put in a personal appearance, but don’t hold your breath. Now in print is the long awaited story of Ambrose’s Civil War career with the Army of the Cumberland, Ambrose Bierce and the Period of Honorable Strife. Ambrose Bierce, famed American author, is best known for his macabre fiction and cynical humor, served as a soldier in the front lines throughout the Civil War. Bierce’s wartime experiences were the transformative events of the young author’s life. Ambrose Bierce and the Period of Honorable Strife for the first time chronicles this pivotal period of Bierce’s life. 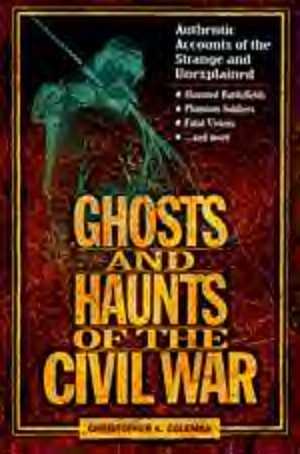 For more Civil War ghosts see: Ghosts and Haunts of the Civil War; for more on General Lee’s Arlington ghosts, plus other famous Southern ghosts, go to Dixie Spirits. For a different perspective on Abraham Lincoln and his beliefs, read The Paranormal Presidency of Abraham Lincoln. The Paranormal Presidency of Abraham Lincoln, documents the beliefs and paranormal experiences of our Nation’s Sixteenth President. Authentic accounts of paranormal encounters on battlefields and Civil War sites. Ghosts & Haunts of the Civil War.